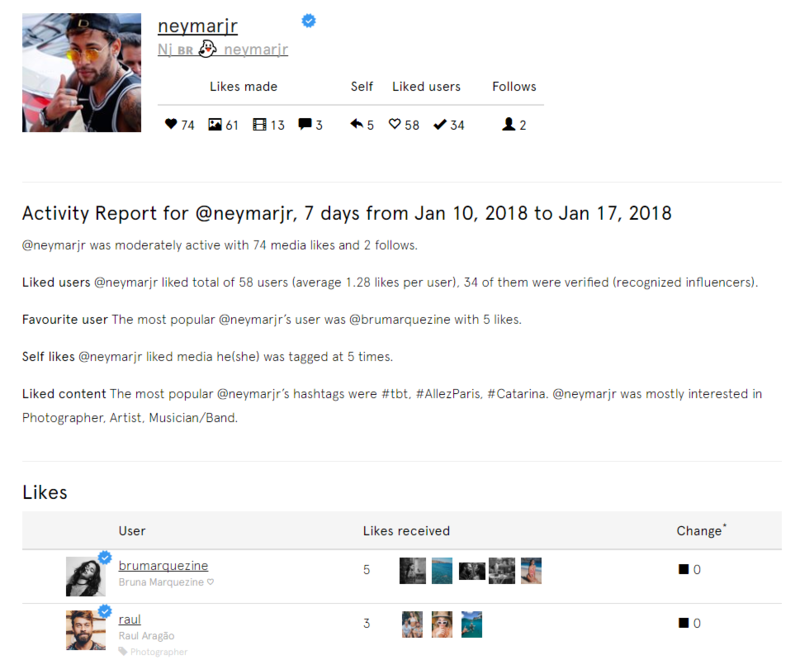 Snoopreport, well known and world’s only Instagram user tracking platform just made it easier to understand user activity report. We rolled out a brief description of user activity, liked media hashtags cloud, user interests cloud and actions hitmap. 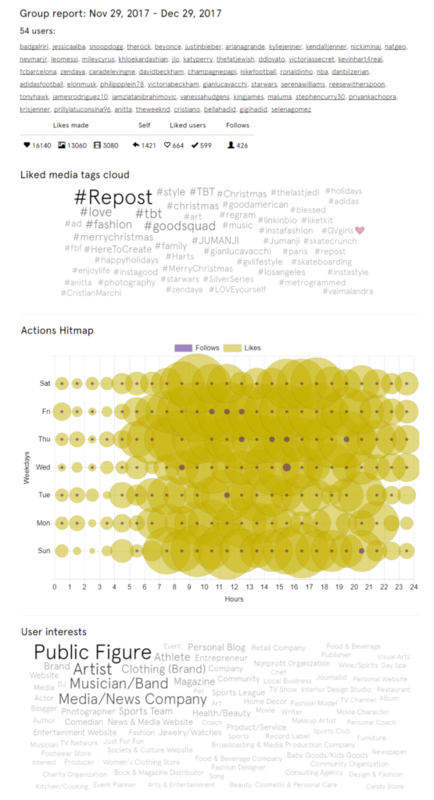 So you can determine the hours and days user most active at and user’s interests in seconds. This data is also applied for the group reports which makes those features even more valuable. All this data is really unique as Instagram doesn’t allow you to filter your following feed to see a certain user activity. Snoopreport does: it provides likes and follows in the weekly and monthly reports with the posts photo snippets that link to Instagram. As you can see from the brief description of the user activity, the service provides the following summary: the number of likes and follows, the number of users whose posts were liked and the number of verified users among them, the favourite user, the number of “likeback” posts, the most popular hashtags in the liked posts and the topics interested to the monitored user. Marketers and researchers need to extract all possible information as they usually make the in-depth analytics to get all possible user insight. That’s why Snoopreport got the new features that can really facilitate the research of Instagram users and save your time and efforts. When you see what photo or video an user liked on Instagram you’re usually curious why this particular post attracted his attention. So you click on it, study the captions, especially hashtags, then click another and so on..This way you can spend many hours to collect all the results and highlight the most used hashtags. You can find out what themes are the most attractive for the user you monitor by checking the hashtags of the posts liked. The brightest hashtags are the most frequently used in liked posts so the user focuses mostly on them when liking a post. To complete the picture of the user’s preferences check user interests containing the categories of the Instagram accounts liked by the user. For example, “hudabeauty” account mostly liked health, beauty, cosmetics and public figure categories so obviously the account dedicated to beauty blog and products likes the similar profiles to attract more followers. The study of the periods when the user is active helps you to research the time frame and days when he signs in on Instagram and checks his newsfeed and the frequency of the Instagram use by the following user. E.g. on the hitmap above it’s evident that Jessica Alba is mostly active from 16.00 to 17.00 and although she uses Instagram every day, she spends more time on Saturdays and Sundays there. The great value has the group report that allows you to see the actions performed by a group of users that you customize yourself and set the time period required. You can monitor your customers and learn what their general interests are or your competitors to find common points in their growth strategies. 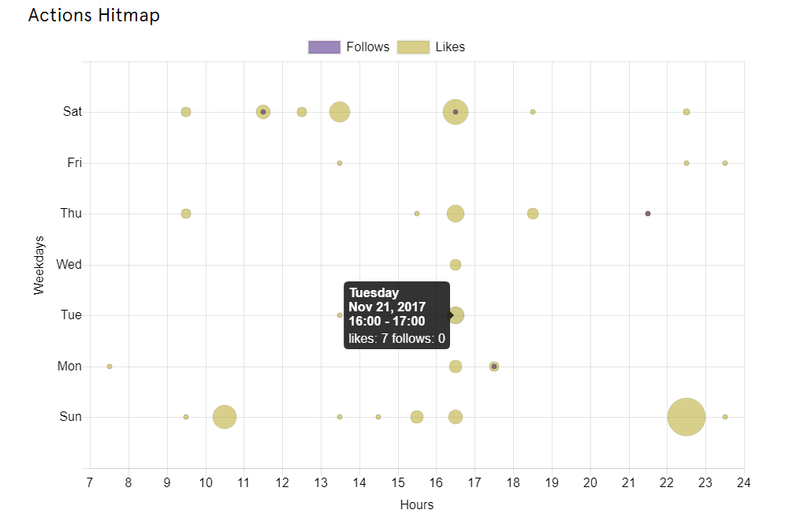 You’ll get the likes and follows made as usual, but also the liked media tags cloud and user interests that inform about the topics drawing the monitored users attention and Actions Hitmap representing the periods of user group activity. choose appropriate hashtags so your posts would be more visible on Instagram feed and expand the reach of Instagram users. Snoopreport makes Instagram analytics much easier so marketers and researchers could benefit from all the Instagram user insight and maximize their marketing performance. There is also an opportunity to use Snoopreport for free. How to Monitor Social Media the Right Way ?